Who doesn’t love Christmas stocking fillers?!?!? Nivea has announced the launch of four limited edition NIVEA Creme Tales tins, featuring a selection of illustrated designs for Christmas. Designed by international artist Joelle Tourlanias, the illustrations are said to have been inspired by real life scenarios transformed into magical moments. On the inside of the lid of each tin is a link to an online fairy-tale, written by children’s author Udo Weigelt. The limited edition range heralds the launch of the brand new 75ml size of NIVEA Creme, available in the UK from January. 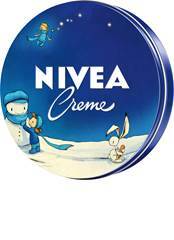 The NIVEA Creme Tales tins (£1.99) are available between October and December in leading retailers nationwide.